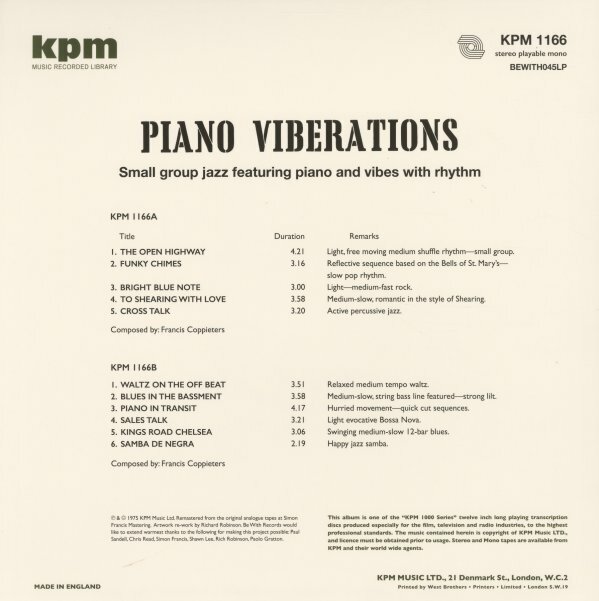 A straight jazz set from KPM, but a great one too – a record that's a great mix of piano and vibes, handled in an almost MPS-ish sort of way! There's a few funky numbers here, and some great rhythms too – very dynamic grooves that are heavy on modal influences, and which really sparkle like some of the best European studio jazz we know from the time. The tracks are all long and well-written too – played with plenty of solo space, and a nice break from the usual sound library mode! It's a shame that the players aren't listed, but given the grooves we can hardly complain – and titles include "The Open Highway", "Funky Chimes", "Cross Talk", "Waltz On The Off Beat", "Sales Talk", "Piano In Transit", "Samba De Negra", and "Blues In The Bassment". © 1996-2019, Dusty Groove, Inc.